There is a gap between man’s powers to conceive and his ability to achieve that can be bridged only by desire. You can see these twin summits to the south while driving on Interstate 10 east of Tucson. Merely viewing summits from afar and climbing them are always two different affairs, but Dos Cabezas amplifies this experience gap. 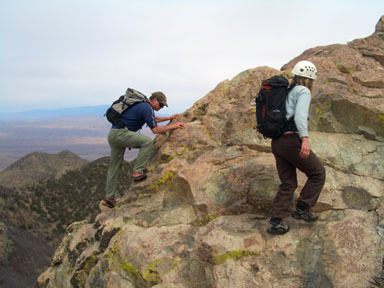 Touching the top of either Cabeza will provide a classic outing, and climbing both heads can produce a lifetime memory. No task too tough for this team! Gerry and Jennifer took the above photos on 3/27/06. The North Peak carries the given elevation of 8,354 feet on the USGS quadrangle, but the South Peak does not have a given elevation. Careful handlevel measurements by many people have concluded that the South Peak is three feet higher than the North Peak, hence this report uses 8,357 feet for the elevation of the South Peak. 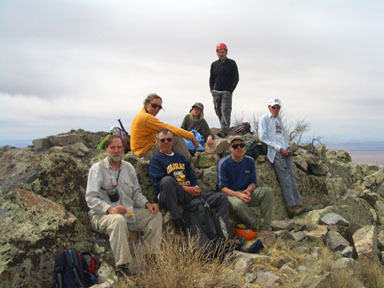 The South Peak has 3,247 feet of prominence and is the 19th most prominent peak in Arizona. There are multiple routes and variations on these two summits. The easiest route on the North Peak (Class 3) is on its upper southwest face, which rises above the saddle between the two peaks. You can reach this saddle from either the west or the east. 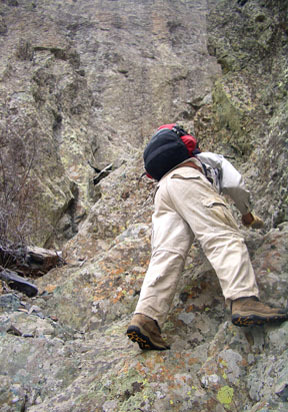 The eastern gully has a Class 4 step in it; the western approach to the saddle is easier, but requires a long bushwhack. 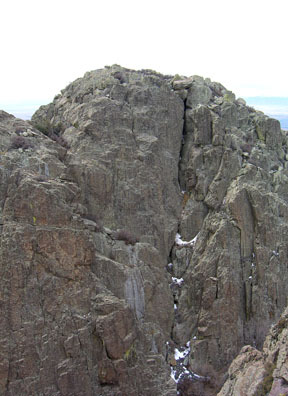 The easiest route on the South Peak (Class 3) is a hard-to-see line on its south face. 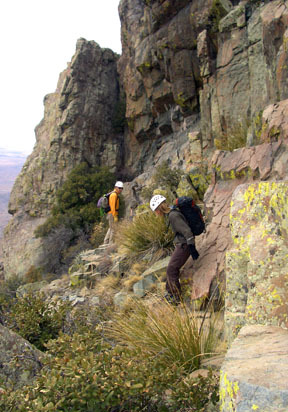 The ascent of both peaks requires ascending or descending the north face of the South Peak (Class 4), and there are arguments for doing the traverse in either direction. If you climb the North Peak first, you can then upclimb the Class 4 crux. 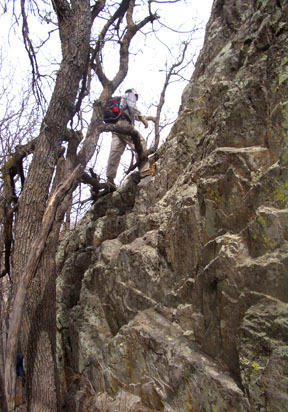 If you climb the South Peak first, you can protect your downclimb with a rope or even rappel over this crux. 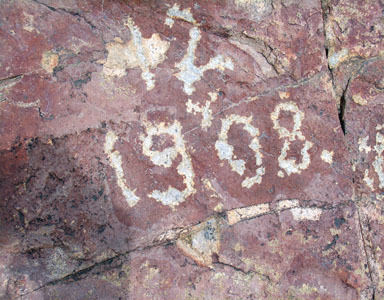 Start at the Mascot Canyon Trailhead northeast of the small town of Dos Cabezas, Arizona. The continuing road up Mascot Canyon is gated 0.5 mile beyond the trailhead, and this is not the route. Leave the canyon road, follow a 4WD road northwest then west up a steep hill, pass an old mine, and continue west up the 4WD road to a small saddle at 6,260 feet. 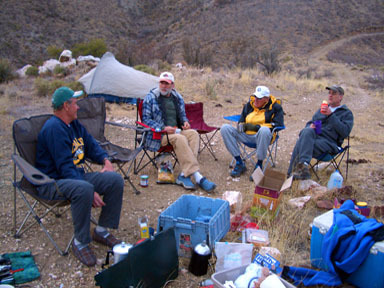 Leave the 4WD road at the 6,260-foot saddle, and hike 0.3 mile north up a steep hill to a ridge at 6,800 feet. Follow this ridge 0.9 mile northwest to some large towers at 7,900 feet. Go around the tower site and descend slightly to some open meadows northwest of the towers. 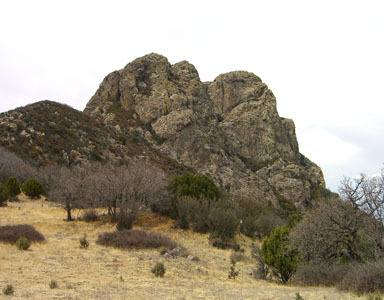 From here, you will have a clear view of Dos Cabezas, and the introduction is over. This is the easiest route on the South Peak. 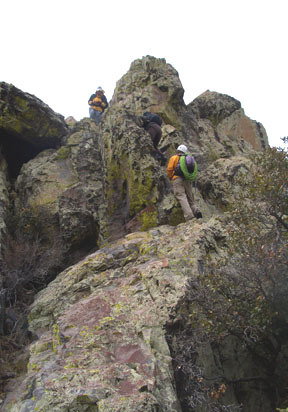 It is a moderate hike followed by hard-to-find, but rewarding Class 3 scrambling. Follow the approach to the meadows just west of the towers. From the meadows, study the south face of the South Peak carefully, since the route is not obvious. The route starts in a large, brushy gully on the lower west (left) of the face, does an ascending traverse up to the east (right) across the face, goes east (right) around a blind corner, ascends a brushy gully high on the east (right) side of the face to the vicinity of a small notch to the east of the South Peak. Launch when ready. From the meadows, bushwhack 0.3 mile northwest up the continuing ridge and get into the large, brushy gully on the lower, west side of the face. Ascend this gully to 8,120 feet, passing a colorful wall on the gully’s east (right) side. Look sharp to the east, find and follow an easy, stepped passage up the rocks on the gully’s east side above the colorful wall. This is the beginning of the Class 3 scrambling. 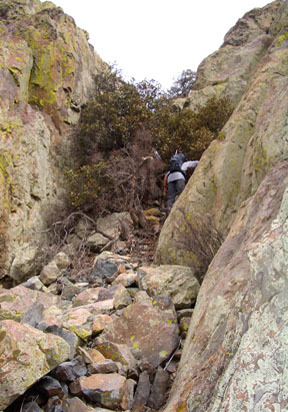 Follow a use trail through the bushes up to the east (right), then scramble up another stepped passage to the east. Follow a broad, but narrowing ledge up to the east (right), go east around a blind corner, and traverse east into the major gully system on the upper, east side of the south face. Follow a use trail up through the bushes in this narrowing gully. 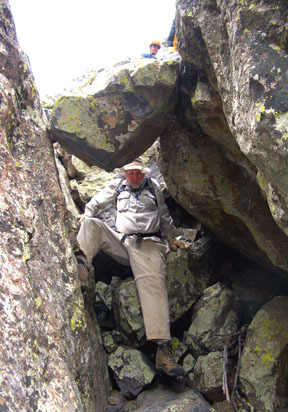 As you approach the top of the gully, scramble under a 6-foot chockstone. 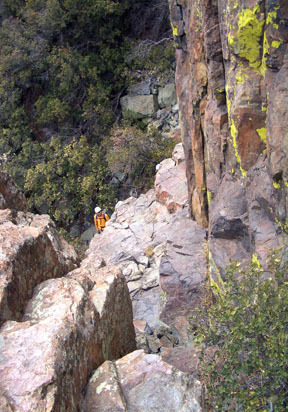 Thirty feet above the chockstone, just below a small notch east of the summit, turn west (left) and scramble up a key passage. Above this, scamper west to the highest point. This is the most expedient route on the North Peak. There is one Class 4 move in the approach gully, but the rest of the route is Class 3 or easier. Follow the approach to the meadows just west of the towers. The South Peak dominates the view from here, but you can also see much of the North Peak. The route reaches the saddle between the two peaks from the east. Most of the gully below this saddle is hidden in your meadow view. From the meadows, go 0.25 mile northwest on the ridge toward the South Peak. Leave the ridge at 8,050 feet, descend on the north side of the ridge and contour north at the 7,900-foot level. 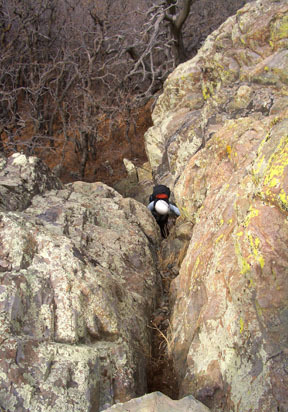 This traverse is steep, rocky and brushy. 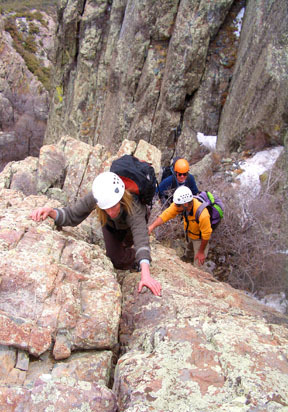 Climb onto the rocks on the South Peak’s lower east face. Do an ascending traverse to the north following the path of least resistance to reach the major gully between the South and North Peaks (Class 3). If you find yourself doing hard climbing on this approach traverse, look around for an easier way. Once in the major gully, scamper west up it to the base of a narrow passage on the gully’s south (left) side. Climb an awkward, Class 4 move to bypass the narrowest spot, then scamper on up to the saddle between the South and North Peaks. Go all the way into the saddle. 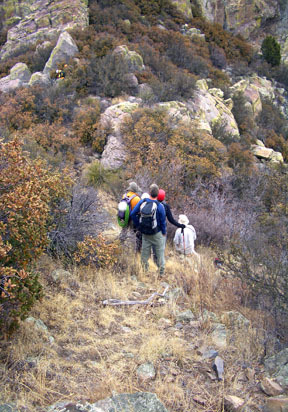 Hike 50 feet down onto the west side of the saddle to the base of a broken, stepped, south-facing passage near a tree. This is the beginning of the route up the upper North Peak. Scramble 40 feet up the initial Class 3 passage, trending west (left) en route, to reach lower-angled terrain. From here you can see much of the rest of the route. Scramble north following the path of least resistance to reach a brushy, 30-foot wide gully on the North Peak’s upper southwest face. Scamper up this gully, utilizing a use trail through the worst bushes, to reach a small notch at the top of the gully. 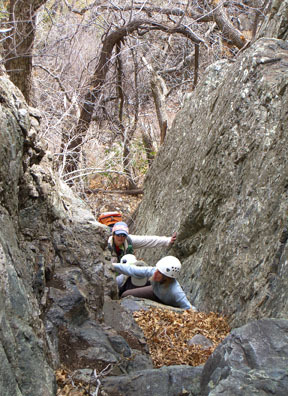 Turn east (right) and scramble up one of several available Class 3 passages to reach another small notch. From here scamper gleefully east up to the highest point. You can avoid the initial Class 3 scramble across the lower east face of the South Peak by staying below all the cliffs and bushwhacking north to the base of the big gully. 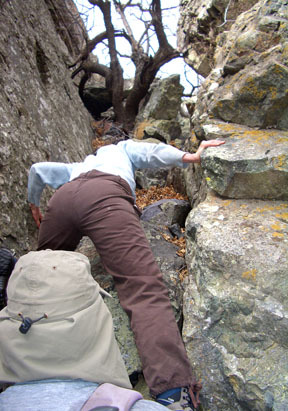 You will be trading scrambling on clean rock for some tough bushwhacking. You can avoid the Class 4 move in the approach gully by bushwhacking all the way around the north side of the North Peak and approaching the saddle from the west. In this case, you will be doing a lot of tough bushwhacking just to avoid one move. 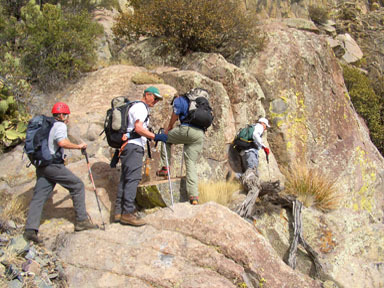 Before reaching the saddle, scramble northeast up a large ramp system, then scramble west to the summit (Class 3). 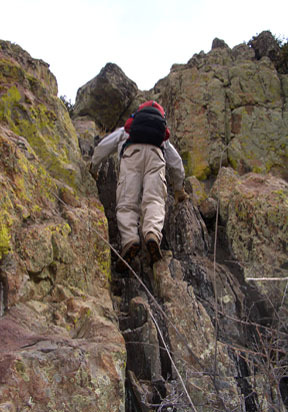 This variation is a little tougher than the standard route. There is an alternate start to the route above the saddle 30 feet down to the west and around a corner from the start by the tree. 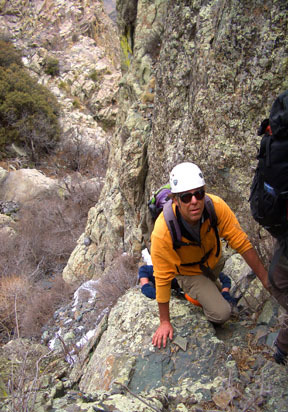 Climb up a V-shape crack for 40 feet to the lower-angled terrain. This start is also Class 3, but is less airy. This is the big one. 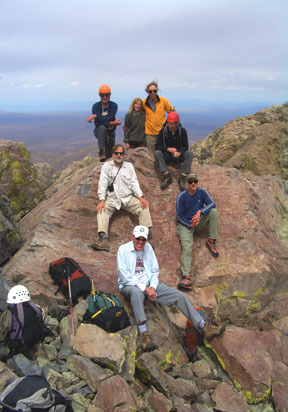 Climb the Southwest Face Route on the North Peak and preview the north face of the South Peak from this strategic vantage. Return to the saddle, hike south above the saddle, and enter the large, central gully on the South Peak’s North Face. Scramble up or just to the right of the center of the gully for 80 feet. As the gully fades into the face above, trend west (right) and continue your steep, Class 3 scrambling for another 100 feet. Climb an exposed, Class 4 slab which is the route’s crux. 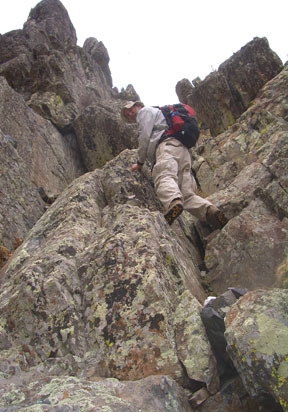 Above the crux, scramble southwest, then southeast to the highest point of the South Peak (Class 3). 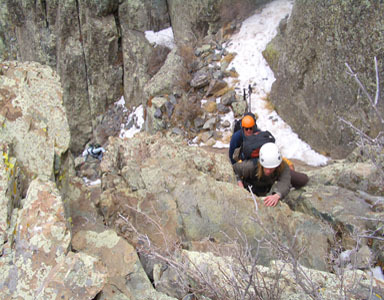 The scrambling on this north face is more serious than the south side routes on either peak, and snow can linger here to complicate your ascent. 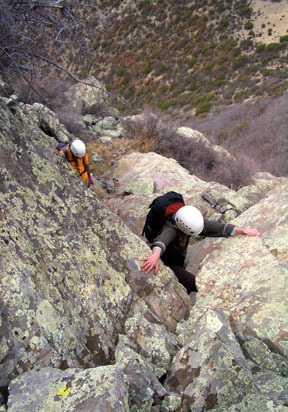 Descend the South Peak’s South Face Route.